Another nail has been driven into the coffin of the Celtic New Zealand thesis but, as Matthew 'Mysterio' Dentith sadly notes, the Franklin E Local doesn't seem to care about facts. A couple of weeks ago I joined about a thousand other Aucklanders on a march down Queen Street to protest Israel's attacks on Gaza. A day or so later, I did a google search to see how the media had covered the event, and discovered a post at NZ Conservative, a blog maintained by a group of Catholics with views firmly on the right of the political spectrum. According to NZ Conservative's source, a mysterious group called 'Kiwi Friends of Israel', the march down Queen Street was characterised by wild anti-semitism, calls for terrorist attacks, Islamic fundamentalism, and conspiracy theories about the 9/11 attacks. It was rather hard for me to reconcile the account of the march on NZ Conservative with my experience of the event. The claims that the march was an exercise in verbal Jew-bashing are particularly risible, because protesters repeatedly and loudly repudiated such attitudes. When protest MC John Minto condemned anti-semitism and noted that ten thousand Israelis, many of them Jewish, had recently marched through Jerusalem against the attacks on Gaza, he was loudly applauded by his fellow protesters. Another speaker, an Islamic scholar from Egypt, echoed Minto's remarks, and also attracted loud applause. The chant 'Allah Akbar' was heard from some marchers, but NZ Conservative's claim that the words are ipso facto an endorsement of terrorism was nonsense - usually they are simply an affirmation of faith and solidarity with fellow believers. Large protests will always attract the odd crank, but it's wrong to generalise the odd crank into the official message of a protest. I did notice a fool wandering down Queen Street with a T shirt that read '9/11 Was an Inside Job', but I saw no evidence that anybody supported his opinion. Many of the people I saw on the demonstration would be very hard to reconcile with the stereotypes thrown around on NZ Conservative. I noticed CK Stead, a man many would consider New Zealand's most distinguished living writer, making his way carefully down the street. I haven't hitherto considered Stead either a jihadi or a loony lefty. His oft-expressed views on subjects like Maori nationalism and the education system would seem to put him on the right of the political spectrum. If the bloggers at NZ Conservative want to find anti-semitism, then they should train their guns on Bishop Richard Williamson, the leader of the ultra-conservative splinter group which has just been welcomed back into the Catholic communion by Pope Benedict XVI. Williamson, who is based in Britain and commands the following of around 150,000 souls, has been for decades been one of the most tireless and high-profile promoters of Holocaust denial and Jewish conspiracy theories. He regards the Protocols of the Elders of Zion as a work of non-fiction, maintains that only a couple of hundred thousand Jews died during World War Two, and blames Hitler's enemies for the 1995 Oklahoma bombing as well as the 9/11 attacks and the 'myth' of Auschwitz. Wiliamson's propaganda has enthusiastically disseminated by the sort of neo-Nazi groups that love to turn anti-semitic theory into murderous practice. The decision to welcome Williamson into the Catholic communion has outraged Jewish groups and liberal Catholics, who suspect that the Pope wants to use Williamson's flock to strengthen the extreme right of the church. NZ Conservative does not appear to share those misgivings: instead of decrying the latest addition to their church, they have been focusing their attention on the evil Friar Burns of Wellington, who splattered a mixture of paint and blood on a memorial to Yitzhak Rabin during an anti-war protest. I would have thought Burns has less blood on his hands than Williamson. According to one of the bloggers at NZ Conservative, the outcry against Williamson is the work of people who 'hate the Catholic church'. As far as I am aware, the issue has appeared on the media radar because of a press release by the Simon Wiesenthal Centre, which was set up to try to bring Nazi war criminals to justice and to expose instances of contemporary anti-semitism. I don't mean to suggest that this group is always correct (it was wrong, for instance, when it characterised Hugo Chavez as an anti-semite) but I am not aware of any evidence that it has an anti-Catholic agenda. In a new statement, the Catholic church has defended its wooing of Williamson with the claim that Holocaust denial and anti-semitism are not 'doctrinal issues', and are therefore, apparently, of secondary importance. I find this a very strange view, because it seems to imply some Chinese Wall between religious and political views - a division which the church seems happy to deny at other times (for instance, when it enters political debate around the issue of abortion). And how exactly can a sincere commitment to Christian theology be squared with a commitment to anti-semitism? I admit I'm rather ignorant of the finer points of the New Testament, but I was under the impression that Jesus himself was a Jew. Perhaps, though, the good Bishop Williamson will drop by in the comments box and correct me on that score. One of the many highlights of our recent civil union was the performance of a piece of contemporary dance called Spirits of the Stone by two members of the acclaimed BackLit Poductions troupe, Rosey Feltham and Janine Parks. 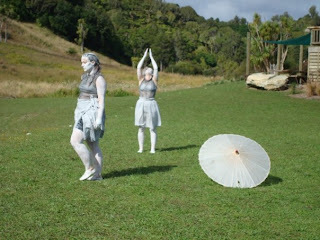 The performance unfolded on the edge of the Waikaretu River, at the foot of a steep, boulder-strewn hill, in the heart of the triangle of land between Huntly, Onewhero and Port Waikato called Limestone Country. When they reached the centre of the area of mown grass, Rosey and Janine placed two large stones on the ground with almost torturous care. They might have been handling live explosives, or new-born babies. After disposing of their cargo, the two began to dance wildly about, as strange music fizzed and crackled from a strategically placed speaker. After several minutes they disappeared behind large sun umbrellas which seemed to have materialised out of thin air. It is relatively easy to describe the look of Spirits of the Stone, but harder to interpret the work. What meaning can we justifiably take from Rosey and Janine’s strange, urgent, wordless rite? Later in the evening, after she had washed off the white clay and stepped into more conventional attire, Rosey talked to me about the dance. She explained that it had been inspired in part by my essay ‘The Discovery of Limestone Country’. In this text, which was mailed out everyone invited to the civil union, I talked about what an extraordinary and disorienting region Limestone Country is, with its juxtapositions of ancient bush and eroding sheep farms, its massive, weirdly-shaped rock formations and its deep, sudden tomos, its abandoned coal pits and lime quarries, and the wild empty beaches on its western margin. I had suggested that Limestone Country was a liminal, mysterious place, the kind of place that inspires visionary experiences, and Rosey said that Spirits of the Stone was an attempt to convey a visionary experience of the region. ‘We were supposed to be stone people, stone spirits, emerging from and celebrating the landscape’, she explained. Rosey’s discussion of her extraordinary dance got me thinking about the words I’d thrown around in my essay. What exactly did I mean by ‘visionary’, for instance? Pakeha cultural tradition is replete with visionary responses to the New Zealand landscape, but not all of these responses have been healthy. Often Pakeha artists have seen their local landscape as an undifferentiated, ahistorical place, a place which both needs and invites the visionary imagination. Colin McCahon’s crucifixions, angels and miracles, Charles Brasch’s famous poem about ‘empty hills crying for meaning’, and Brent Wong’s hallucinatory foreign buildings floating over empty local landscapes are all examples of the tendency to see New Zealand as an historically and culturally barren land ripe for myth-making. Despite their beauty and obvious emotional authenticity, the paintings of McCahon and the poems of Brasch implicitly ignore the real history of New Zealand. Hadn’t people lived in these islands for many hundreds of years before McCahon picked up a brush and Brasch sat down at his typewriter? Did they not have ways of inhabiting their landscape - ways of ‘being at home’, to paraphrase Brasch - which were worth taking into account? Did they really need melancholic Pakeha intellectuals to teach them how to see their homeland? The poet Kendrick Smithyman asked questions like those decades ago. In his book A Way of Saying, Smithyman attacked Brasch and his co-thinkers for using myths prefabricated in the Old World to avoid the reality of New Zealand life in all its richness and diversity. Smithyman found Brasch’s talk about hills crying for meaning hard to swallow – having grown up in rural Northland, he thought of pa sites and ancient gardens whenever he looked at hills. Smithyman had similar problems with Brasch’s poem ‘Rangitoto’, which presented Aucklanders’ favourite island as a brooding, malignly magical place devoid of any real connection to human history. Smithyman believed that Brasch’s vision of Rangitoto was based on a failure to appreciate the history of human uses of the island, and the role that the island continued to play in the life of the people who lived around and on it. Smithyman’s remarks about Brasch’s poetry can be taken as a rebuke to a whole range of expressions of what we can fairly call mystical Pakeha nationalism. Although Brasch’s poems are unfashionable today, the vision of New Zealand they express is still popular in some quarters. Perhaps the most crazed present-day manifestation of mystical Pakeha nationalism is the Celtic New Zealand ‘movement’, a collection of far right political activists, conspiracy theorists, and amateur archaeologists united by the belief that these islands were settled thousands of years ago by technologically advanced, peaceful white people who were eventually wiped out by the ‘savage’ Polynesian ancestors of the Maori. It is allegedly Celts, not Polynesians, who are responsible for the hei tiki, the carved meeting house, and epic voyages across the Pacific. Like Brasch and McCahon, the members of the Celtic New Zealand movement are desperate to construct a myth which gives them a sense of identity and a connection with the landscape around them. Victims of the Celtic New Zealand ideology wander the backblocks of this country, hallucinating. They encounter piles of stones left by ancient Maori clearing the land for gardens, and believe they have discovered the remains of Druidic temples. They decide that Maori pa are actually the remains of ancient Celtic observatories. One of the most popular habitats of Celtic New Zealand ‘researchers’ is Limestone Country. An ancient Celtic ‘stone village’ supposedly existed into historical times at the mouth of the Waikaretu River, and an extinct tribe of white ‘tall ones’ have allegedly left ten foot long skeletons in caves south of Port Waikato. The Celtic New Zealand movement perhaps confirms, then, that Limestone Country is indeed a ‘liminal’ place, which inspires fantastic imaginative gambits. Is it possible, though, for us to make another, healthier, imaginative response to our landscape? Is there a way that a place like Limestone Country can inspire our imagination, without having its real history diminished or displaced by our imaginings? Once again, Kendrick Smithyman can help answer our questions. Smithyman’s best poems have a visionary quality which is developed out of rather than counterposed to the reality and history of New Zealand. In his famous poem ‘Hitching’, for instance, Smithyman drives through the Desert Road area of the central North Island, where he encounters Te Kooti, the legendary nineteenth century guerilla fighter and prophet, disguised as a horny hippy hitchhiker. 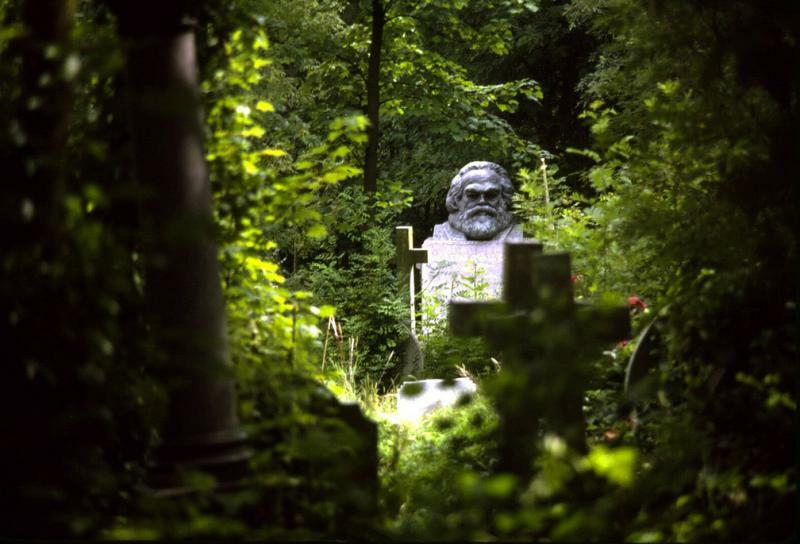 Smithyman’s hallucination may be fantastic, but it is connected to the real history of the place he is travelling through. Te Kooti did once roam the central North Island, and the wild ponies Smithyman can see from his car are descendants of the creatures the prophet’s ragtag army brought to the area. Smithyman’s vision is inspired and confirmed by the landscape around him. It enriches rather than abolishes reality. Another writer who combines an openness to visionary experience with a respect for reality is Martin Edmond, whose books move disconcertingly but credibly between autobiography, history, and hallucination. In his 2004 volume Chronicles of the Unsung, for instance, Edmond drops acid on Kawau Island, where he has gone to research the life of Governor George Grey, and experiences a terrifying vision of Te Whiro, the Maori God associated with sickness and decay. Edmond’s vision is not an interruption so much as a heightening of reality. It flows from his profound understanding of the darkness in the heart of Governor Grey – the bigoted imperialist who started the Waikato War in 1863 – and some of his more narrow-minded descendants. Like Smithyman and Edmond, Rosey Feltham and Janine Parks are able to combine a visionary apprehension of the New Zealand landscape with respect for the history that shaped that landscape. Spirits of the Stone may be a fantasy, but it is no mere work of whimsy. 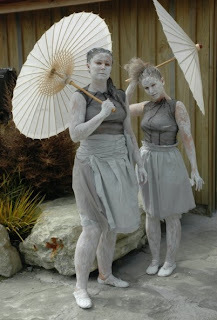 The ‘spirits’ in the dance are at once corporeal and ethereal – their white costumes and smeared skins make them look like ghosts, but they can also be associated with the boulders and spurs of Limestone Country. Because it is so soft, limestone is easily caved by water and wind, and the area between Waikaretu and Port Waikato is studded with hundreds of openings and tunnels of various sizes. Many caves contain the bones of ancestors of the various Tainui peoples who are the region’s tangata whenua. To the annoyance of speleolgists and the fury of Celtic New Zealand ‘researchers’, a number of huge caves near Port Waikato have been declared tapu, and made off-limits to non-Maori. Yet the cave can be a place associated with life, as well as death – a number of Maori oral traditions speak of autochthonous ancestors who emerged from caves onto the surface of Aotearoa. In Rosey and Janine’s dance, stones are brought and laid before the audience with a care and respect worthy of either the bones of the dead or the bodies of the newborn. 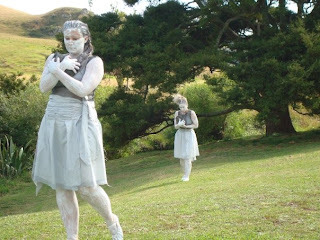 In their direct emergence from the land, the ‘stone spirits’ allude not only to an element of Maori oral tradition but to long-held Pakeha dreams of indigenity. As we have already noted, the desire to cast off the status of settlers or ‘second people’ and become autochtonous is a theme that runs through much Pakeha art and literature. In the poetry of Brasch, in the paintings of McCahon, and in the pseudo-scholarship of the Celtic New Zealand movement, the desire leads to the construction of myths which deny the real history of these islands. In Spirits of the Stone, though, the yearning for a direct connection with the land is presented less negatively. 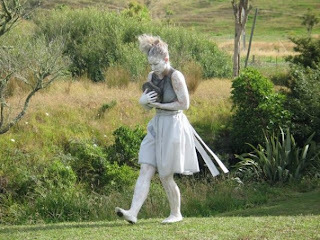 Rosey Feltham whakapapas back to Te Arawa as well as Pakeha ancestors, and the intricate manoeuvres of the second part of Spirits of the Stone allude to both Maori and European dance traditions. At times the spirits move with the grace of ballet dancers; at other moments they make stiff, awkward motions that recall the innovations of contemporary dance; at still other points they discover some of the powerful rhythms of traditional Maori dance. The mixture of grace, awkwardness, and power is appropriate to beings that are at once physical and supernatural. The syncretism of Spirits of the Stone is well-suited to the dance’s setting. Unlike many other parts of the Waikato region, where divisions created by the wars and land confiscations of the nineteenth century linger on, the countryside around Waikaretu has seen the growth of a hybrid Maori-Pakeha culture. Maori and Pakeha families have regularly intermarried, many Maori words have entered the lexicon of local Pakeha, and marae are often used as meeting places for the entire community. It was an honour to receive Spirits of the Stone as a civil union gift. The dance is both visually impressive and thought-provoking, and my comments here have only hinted at its richness. I hope Rosey and Janine will perform it again. Yes, the big day finally came. Thanks to everyone who helped make our civil union in the middle of the magical space known as Limestone Country so good, from the readers of cryptic modernist poetry to the family members and friends who spoke so kindly to the dancers smeared in white clay (more on their extraordinary performance in a later post) to the kind fellows who delivered seemingly limitless supplies of beer, sausages, steak, and vegetarian quiche. I am now trying to lose weight. The New Zealand Herald has made a typically pompous contribution to the argument about whether a Maori flag should be flown over Auckland's harbour bridge on Waitangi Day. According to an editorial in last Sunday's Herald, Maori are divided about what flag best represents them, with the 1990 'tino rangatiratanga' banner competing for allegiance with Te Kooti's flags, King Tawhiao's ensign, and various iwi banners. It is difficult to see much merit to this claim: although the flags used during the nineteenth century wars have great mana, they have seldom appeared on latter-day expressions of pan-Maori unity, like the 1975 Land March or the 2004 Seabed and Foreshore hikoi. Banners representing particular iwi are seen more often, but their popularity in particular rohe does not affect the legimitacy of the pan-Maori 'tino rangatiratanga' banner. Just as the state of Texas flies its 'Lone Star' beside the United States' national flag, so iwi commonly fly their own flags beside the tino rangatiratanga banner. The Herald's editorial dismisses the one flag which might threaten the tino rangatiratanga flag as a symbol of pan-Maori unity - the banner created to mark the 1835 declaration of New Zealand independence. The Herald is quite wrong when it suggests that the 1835 flag is nothing more than a relic of history, and that the fact that it was designed by non-Maori makes it ridiculous. Like all symbols, flags have a way of taking on a life of their own. Is the Te Kooti battle banner reproduced above inauthentic, just because it borrows from the Union Jack and the Southern Cross motif found on New Zealand's official flag? Just as many Pakeha associate the name 'New Zealand' with their heritage, despite its Dutch origins, so many Maori see the 1835 flag as a symbol of their resistance to colonisation, despite its origins in the imaginations of Europeans. In today's Herald, the paper's token liberal commentator Brian Rudman suggests that the tino rangatiratanga banner should fly alone over the harbour bridge, as New Zealand's new national flag. I disagree with Rudman, because I think that the many Pakeha New Zealanders who identify with the current flag deserve to have their history and culture acknowledged. For better or worse, the British Crown and its settler subjects have played a huge role in making New Zealand what it is, and their contribution needs to be remembered, even if remembrance sometimes takes the form of criticism. The messy story of Pakeha-Maori relations in Aotearoa/New Zealand can only be obscured by the politically correct substitution that Rudman advocates. We need to both acknowledge and dehegemonise Pakeha history and culture. The talkback callers and letter writers who rave about 'one flag for one nation' and insist that 'we're all New Zealanders now' need to understand that many of their compatriots see the 'national' flag as the symbol of an alien power. These Pakeha will only be made angrier and deafer by the arbitrary abandonment of the current national flag and other symbols of their history and culture. By flying the current national flag alongside a Maori banner, we stand a much greater chance of making them think about the complicated nature of their country's history, and drawing them into a dialogue. John Key's claim that Maori are divided about what flag best represents them has received short shrift from a number of commentators, including the redoubtable Titewhai Harawira, who has insisted that the 1990 'Tino rangatiratannga' banner is the only flag to have been designed 'for Maori, by Maori'. The best-known Maori flag designed by non-Maori must be the banner associated with the 1835 Declaration of Independence; despite its origins in the imaginations of missionaries, this ensign has had an honourable place in many expressions of resistance to colonialism: in November 2007, for instance, I saw it being flown in Tuhoe country in the aftermath of the police raids on Ruatoki. A later, much less well-known flag designed for Maori by Pakeha can be found in a small church in the small town of Te Awamutu. Nowadays the town of Te Awamutu might seem, to the casual intruder, like something out of one of Gary McCormick's hokey odes to the 'Kiwi heartland' - the shops on the main street have held on to their 1950s facades, kids in long shorts kick rugby balls outside the RSA, and in the municipal garden elderly couples walk arm and arm besides beds of roses with names like 'Imperial red'. But this tranquil little place in the central Waikato was once a militarised border town, where British troops and farmer militiamen peered anxiously south from their redoubts toward the independent Maori nation on the far side of the Puniu River. British and colonial forces invaded the Waikato in 1863, and soon war came to the countryside around Te Awamutu. It was at the battle of Orakau, a few kilometres south of the town, that the great chief Rewi Maniapoto leaped to his feet and shouted 'Ka whaiwhai tonu motu ake ake ake' (I will fight for ever, for ever and ever), a phrase which was immortalised by New Zealand's first feature film, and which still trips from the tongues of troublemakers like Tame Iti. After Rewi retreated with his Waikato allies into the rugged country on the far side of the Puniu, Te Awamutu grew quickly into the centre of a network of colonial fortifications and garrisons designed to protect the new frontier between Christian civilisation and brown barbarism. Not until the mid-1880s was the 'King Country' opened to European settlement. On an unreasonably hot day near the end of last year, I visited Te Awamutu with Skyler's parents and two of her grandparents. The grandparents arrived relatively recently from dear old Blighty, and they were pleasantly surprised to discover that a barabrous country like New Zealand could harbour gardens full of beds of roses with names like 'Imperial red'. They were even more surprised when I showed them St Johns, the little Anglican church built at Te Awamutu a full nine years before the invasion of the Waikato. 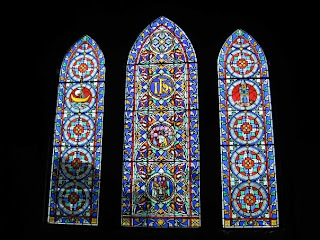 St Johns is the fourth oldest complete church in New Zealand, and its early Victorian stained glass windows have an aged beauty which reminded Skyler's gran and pop of their driving tours of the old country's cathedrals. The cemetery around St Johns is sprinkled with the stones of British and 'friendly Maori' soldiers who fell in the fighting around Te Awamutu - one poor Brit managed to fight in the Crimean and Taranaki Wars before catching a bullet in the Waikato. Inside the church two banners hang above a wooden plaque on which the names of some of the victims of the local fighting are written. Alongside the musty Union Jack, a very peculiar banner commemorates the Maori who fought against Queen Victoria and her local allies. In the nineteenth century Maori quickly adopted the European practice of flying flags on the battlefield, but the flag representing 'Rewi and his people' looks like no Maori banner I have ever seen. It looks suspiciously like a flag which was created for St Johns by Pakeha who wanted to commemorate the Maori who fought for Te Awamutu: as such, it may shine a light on nineteenth century Pakeha attitudes towards Maori nationalism and resistance to colonialism. The flag-makers have avoided any of the imagery used by Maori rebels - the rising star of King Tawhiao, the three stars and 'Ringatu cross' of Te Kooti, and the three-pronged feather of Te Whiti's flag are all absent. Do we find on this banner the earliest example of the use of the fern as an emblem representing a group of New Zealanders? Three hundred kilometres away, in New Plymouth's museum, a more famous Maori banner is on display. Te Whiti's flag flew over Parihaka during the dramatic years of the 1880s and '90s, but it was lost sometime in the twentieth century, and this copy was created by a Waikato artist in 1973, who analysed photographs closely to make sure he got the shades of red and blue correct. Which is more authentic - the original of a fake flag, or a meticulous copy of a banner which no longer exists? 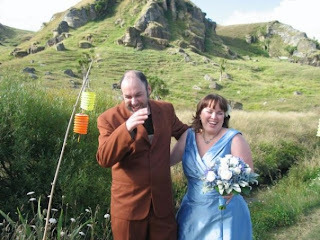 I've got a piece up at the Scoop Review of Books which uses Don De Lillo's novel Libra to get inside the head of my old comrade in the anti-war movement, Rob Gilchrist, who has lately become the most famous police mole in Kiwi history. I argue that De Lillo's portraits of Lee Harvey Oswald and some of the other damaged characters associated with the fate of John F Kennedy can teach us a great deal about Gilchrist's reasons for spending a decade of his life spying on his friends and partners. Take a look here. I'm using this page to store a few links to posts critiquing pseudo-history and related forms of pseudo-scholarship. Have racists taken over Dargaville museum? Why is the Women's Bookshop promoting Graham Menzies? Why is a Gavin Menzies disciple obsessed with the urupa at Wairau Bar? Should the University of Auckland be hosting an exhibition that celebrates Gavin Menzies? Organic yoghurt, tofu - and neo-Nazi nutbars? This week marks the thirtieth anniversary of the overthrow of Pol Pot's Khmer Rouge government in Cambodia. Talking about the anniversary last night, a BBC correspondent described Pol Pot's ideology as 'brutal backward-looking agrarian communism'. There's no doubt that many people would agree with such a designation: for many Westerners, in particular, the Khmer Rouge's journey to 'Year Zero' represents a violent rejection of every feature of the modern world. Many scholars who specialise in the study of the traumatic modern history of Indochina are more cautious. Pol Pot's ferocious and obscurantist regime has long puzzled historians and political scientists, but the gradual publication of many of the internal documents produced by the Khmer Rouge from between 1975 and 1978 has assisted understanding. The documents collected in English translation in a Yale University Press volume called Pol Pot Plans the Future would make interesting reading for anyone who believes that the Khmer Rouge were dedicated to an agrarian, autarkic society. The five-year plan that Pol Pot produced shortly after taking power calls for a massive increase in agricultural production, but it envisaged funneling increased yields of rice and other crops overseas, not back to the long-suffering Khmer people. Pol Pot wanted to earn enough foreign revenue from agricultural exports to be able to fund the construction of heavy industry, and in particular steel mills, across Cambodia. He insisted on paying for this crash course in industrialisation without resorting to foreign capital because he believed that taking loans would make Cambodia dependent on foreign powers. The Khmer Rouge was always a deeply xenophobic organisation, but it was nevertheless strongly influenced by Mao Zedong's brand of communism. Mao's China was one of the few countries that Pol Pot's paranoid regime managed to maintain amicable relations with, and Mao's Great Leap Forward can be seen as the model for the Khmer Rouge's five year plan. The Great Leap Forward was a product of Mao's desire to turn China into an industrialised country with a First World standard of living, and it was as great a disaster as Pol Pot's plan. Both Mao and Pol Pot are often considered exemplars of a peasant-based, agrarian communism, but their ambitions and some of their methods actually had more in common with the 'modernisation theory' still promoted enthusiastically in the capitalist Third World by Western-educated tehnocrats. The reckless attempts to resettle millions of Javanese in remote areas of Suharto's Indonesia, and thereby raise the country's agricultural output, have something in common with Pol Pot's policies. Mao's forcible 'proletarianisation' of millions of peasants during the Great Leap Forward can only remind us today of the enclosure of the countryside in many parts of today's Third World, and the 'conversion' of small landowners into low-wage workers in factories. The ferocity and incompetence of Pol Pot's regime were exceptional, but some of its ambitions were all too familiar. If we want to know what real 'agrarian communism' might look like, we should consider the story of East Timor's revolution, or Marx's late writings about Russia, rather than the regimes of Mao and Pol Pot. I love cats, but I sometimes doubt their taste in movies. My cat Smudge (well, she's half my cat - Skyler, I'll grudgingly agree, owns her tail and hindquarters) can never make it the whole way through classic flicks like Lone Star or Summer of Sam: by the time one of the scenes I know by heart comes along Smudgie's purring noisily in my lap, and I've got no one to recite Kris Kristofferson's or Spike Lee's lines to (Skyler has long since stopped tolerating my habit of obsessively rewatching my favourite movies and ignoring most new releases). It's not that Smudge is wholly resistant to the moving image: Shortland Street always seems to get her undivided attention. Schroedinger's Tabby might be able to run a nice blog, but I'm not sure whether she and I would enjoy watching a movie together, if her praise for Baz Luhrmann's execrable Australia is any guide. How can I describe the monumental bad taste of the film, without coming across as hopelessly shrill and self-righteous, a la Germaine Greer? Instead of discussing Australia, let me tell you about an idea for a movie that I've been turning over in my head since I was forced to sit through Luhrmann's epic. I don't have a script yet - just some ideas about genre and the skeleton of a narrative. Part of the movie I want to make is about a little half-Jewish boy, his Mum, his grandfather, and a few of his other Jewish relations, all of whom are being persecuted by Germans during the Nazi era. At the start of the film, the little boy watches his grandfather being framed for a murder he did not commit, and hunted by a detachment of the Gestapo. The little boy is also being hunted, by a group of Nazi eugenicists who want to place him with an Aryan family and eventually 'breed the Jewishness' out of his descendants. About a third of the way through my movie, the mother of the little boy dies horribly while trying to protect him from the Nazis. Another member of the family is trapped and executed near the end of the film. I know all this sounds a bit morbid and Schindlers List-like but, rest assured, my movie will have its sunny spots. I want to leave my audience feeling good, and to showcase some of the delights of 1940s Germany. To stop things from getting too maudlin, the scenes of the boy and his Jewish relations being tormented will segue into romantic encounters between a handsome young German couple, as well as humourous exchanges between off-duty Gestapo officers and other Nazis drinking in Aryan-only bars. And the part-Jewish boy will come to realise that the death of his mother isn't a reason for despair: after losing her he'll cry for a few minutes, then be consoled by the jokes a beautiful young German woman will tell. He'll soon be enthusiastically working - without pay, of course - for the woman, who runs a factory stolen from Jews by Germans. My little half-breed will find happiness by risking his life attempting a very difficult task in the factory - a task that will, if completed successfully, make some much-needed profits for his pretty Aryan owner. Of course, the little boy will manage the task, and the Germans will get to hold on to the factory they took from the Jews. Everyone except a few Jews will live happily ever after. I know what you're thinking. No director or scriptwriter could ever be crass enough to take up the sort of project I've been sketching out. Who, you're asking, could possibly think it acceptable to interlace scenes from a genocide with scenes of sweet romance and light comedy? Who would be crass or stupid enough to show the perpetrators of that genocide as cute lovers or loveable wisecracking rogues? After suffering through Australia, you'll have an answer to those questions. I'm hungover, I've had five hours' sleep, I've got six hundred e mails to read, after taking a sabbatical from the computer for a week or so, and the news from the Middle East and South Asia looks awful. FORGIVE MY INDIGNATION IF THIS MESSAGE COMES TO YOU AS A SURPRISE AND MAY OFFEND YOUR PERSONALITY FOR CONTACTING YOU WITHOUT YOUR PRIOR CONSENT AND WRITING THROUGH THIS CHANNEL. IF YOU DON'T LIKE THEN THAT IS TOUGH GOOD SIR. THAT IS TOUGH AND THAT IT LIFE. EMPEROR BOKASSA USED TO BEAT YOUTHS WITH STICKS. LIFE IS HARD. SOME SAY HE WAS CANNIBAL. I GOT YOUR CONTACT FROM THE PROFFESIONAL DATA BASE FOUND IN THE INTERNET YAHOO TOURIST SEARCH. I KNOW ALL YOU. I NOT YOUR FAN JUST FRIEND. I WAS SEARCHING FOR A FOREIGN RELIABLE PARTNER. NOT PARTNER LIKE LOVE OR EVEN SAX. FINANCIALLY WE ARE COMPATIBE. I WELL ASSURED OF YOUR CAPABILITY AND RELIABILITY TO CHAMPION THIS BUSINESS OPPORTUNITY. AFTER SERIES OF PRAYERS/FASTING. I WAS DIVINELY DIRECTED TO CONTACT YOU AMONG OTHER NAMES FOUND IN THE DATA BASE YAHOO TOURIST SEARCH.I BELIEVE THAT GOD HAS A WAY OF HELPING WHO IS IN NEED. MY NAME IS MR ISSA AHMED.THE BILL AND EXCHANGE(ASSISTANT) MANAGER OF THE BANK OF AFRICA OUAGADOUGUO BURKINA FASO.DO NOT TAKE THIS TRANSACTION TO BE A JOKE BECAUSE IT IS MY LIFE. I NEED YOUR URGENT ASSISTANCE IN TRANSFERRING THE SUM OF $22.3MILLION IMMEDIATELY TO MY ACCOUNT. THE MONEY HAS BEEN DORMANT FOR MANY YEARS IN YOUR BANK HERE WITHOUT ANY BODY COMING FOR THE CLAIM.